A farmer harvesting water from a well for his goats and sheep. 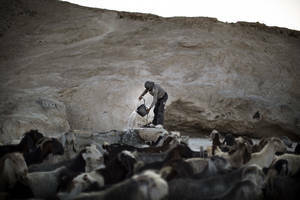 Arab states must continue to seek innovations to overcome water scarcity in the face of climate change, said UN Food and Agriculture Organization Director-General José Graziano da Silva at an event co-hosted by the Arab League on the sidelines of FAO’s biennial Conference. In the Near East and North Africa region, the per capita renewable water availability is around 600 cubic metres per person per year – only 10 percent of the world average – and drops to just 100 cubic metres in some countries. The Director-General praised Near East and North African countries’ progress, despite the challenges, in areas such as desalination, water harvesting, drip irrigation and treating wastewater. The main problem affecting groundwater resources in the MENA region is the myriad and scattered number of groundwater users. Study results, based on on advanced modeling methods, show that 65% of all irrigated areas within 40 kilometers downstream from urban centers – amounting to about 35.9 million hectares (Mha) worldwide – are affected by wastewater flows to a large degree. Of this total area, 29.3 Mha are in countries where wastewater treatment is very limited, exposing 885 million urban consumers as well as farmers and food vendors to serious health risks. Five countries – China, India, Pakistan, Mexico and Iran – account for most of this cropland. The new findings supersede a widely cited 2004 estimate, based on case studies in some 70 countries and expert opinion, which had put the cropland area irrigated with wastewater at a maximum of 20 million hectares. In the first phase of the Africa RISING project in the Ethiopian highlands, the International Water Management Institute (IWMI) investigated technologies that could improve farmers’ access and use of the available water in their surroundings for better agricultural production and productivity. Water scarcity and lack of technologies for accessing and managing available water are major constraints to farming in Ethiopia. Starting in August 2015, IWMI introduced and tested the effectiveness of water lifting technologies such as solar-powered irrigation pumps that help farmers’ easily access water from near their farms. The solar pump-based irrigation was tested in the Southern Nations Nationalities and Peoples Region. Farmers from the Upper Gana and Jawe kebeles used these pumps to irrigate fodder (oats and vetch mixed cropping) for their animals and fruits and vegetables farms in the dry seasons. An assessment showed that most of the farmers used the pumps to lift water for domestic purposes and agriculture across seasons. They claimed improved production and productivity; saved labour and time and improved access to clean water. 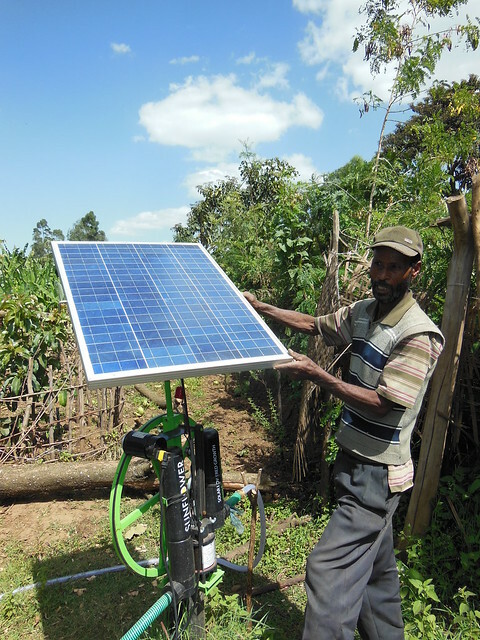 To expand these benefits to more farmers, IWMI, the Solar Development PLC (the main supplier of solar pumps in Ethiopia) and partners are working together to accelerate wider adoption of the technology as a key goal of the second phase (2017-2021) of the Africa RISING project. Community rights around large dams. In February 2017, the Global Water Initiative (GWI) West Africa released an animation explaining how policymakers can work with local communities to protect the rights of people affected by large dams in West Africa. The animation is the first in a series of three animations looking at community rights around large dams. It is available in English and French, and can be viewed at the IIED website. The second animation in the collection looks at revenue sharing from dams and will be released next week – watch this space! For further information on GWI contact Jamie Skinner (jamie.skinner@iied.org), principal researcher, IIED’s Natural Resources research group. Irrigation and agricultural development in rural areas of Limpopo Province, South Africa. Ambitious efforts are underway in Africa to promote the spread of smallholder irrigation. This work is critical for achieving sustainable intensification of agriculture and for enhancing its resilience in the face of more frequent and severe droughts. As part of its concerted support for such efforts, the International Water Management Institute (IWMI) has published a new study – titled Smallholder irrigation schemes in the Limpopo Province, South Africa (Working Paper 174) – which sheds light on the underutilization of these schemes in former “homeland” areas of a key agricultural province. Working in collaboration with the Department of Agriculture, Forestry and Fisheries (DAFF) and the Limpopo Department of Agriculture and Rural Development (LDARD), a team of researchers lead by IWMI principal researcher Barbara van Koppen conducted a survey of 76 public smallholder irrigation schemes. Their purpose was to establish a baseline understanding of key features of these schemes, including smallholders’ perceptions about their limitations. IWMI Working Paper – 174: Smallholder irrigation schemes in the Limpopo Province, South Africa. A survey of 76 public smallholder irrigation schemes in the Limpopo Province was jointly conducted by the International Water Management Institute (IWMI), Department of Agriculture, Forestry and Fisheries (DAFF), South Africa, and the Limpopo Department of Agriculture and Rural Development (LDARD), as part of the ‘Revitalization of Smallholder Irrigation in South Africa’ project. About one-third of those schemes was fully utilized; one-third partially utilized; and one-third not utilized in the winter of 2015; however, no single socioeconomic, physical, agronomic and marketing variable could explain these differences in utilization. Sale, mostly for informal markets, appeared the most important goal. Dilapidated infrastructure was the most important constraint cited by the farmers. The study recommends ways to overcome the build-neglect-rebuild syndrome, and to learn lessons from informal irrigation, which covers an area three to four times as large as public irrigation schemes in the province.